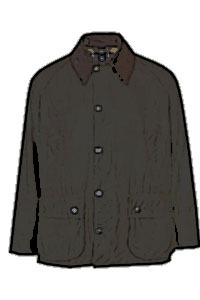 from the Barbour 'Classic' or 'Sporting' ranges. 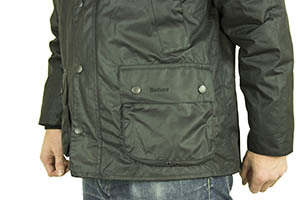 The most popular jackets are based around three styles: the Bedale, Beaufort and Border so we'll deal with those first. The main difference between the 3 styles is the length (see below for measurements). 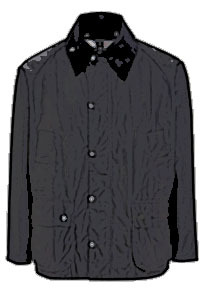 The Bedale is a short equestrian style jacket, the Beaufort is mid length and the Border is longer again. 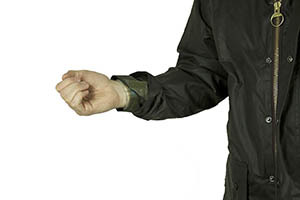 The images below show the three different jackets (all the same size) on the same model so you can compare the length. If you are horse riding or cycling you may want a Bedale cut so you don't end up sitting on the lower part of the jacket. If you want fuller protection afforded by the longer length or often walk through deep undergrowth you may go for a Border cut. If you want a standard length jacket that is long enough to cover a suit jacket you may go for the Beaufort. It may be that for you, it just comes down to which one you like the look of. 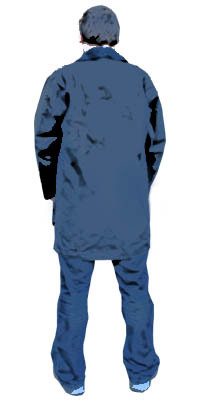 It should be noted that the shorter jackets are lighter, for the obvious reason they contain less cloth. When you have decided what length you want, the next decision to consider, and one of the most common questions we are asked about, is what fabric you want. These three styles come in two choices of fabric - Traditional Waxed Cotton or Sylkoil. The images below show both kinds of fabric and attempt to show the differences between the two but it is far better if you can look at the fabric in person to really appreciate the difference. For directions to our store please click here. Sylkoil has a drier feel, is more flexible and tends to have rich variations of colour and finish. Traditional wax tends to look slightly shinier and the fabric feels a little stiffer. 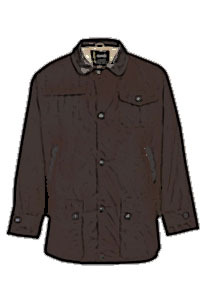 If you want the traditional image of a Barbour then traditional wax is the way to go. Also, if you want the jacket in any colour other than green then you will need traditional waxed cotton as Sylkoil is now only available in Olive. The Border comes in Sage or Navy and the Bedale and Beaufort comes in Sage, Navy, Black or Rustic. 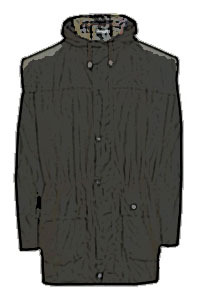 The jackets in Sylkoil are prefixed by the term 'Classic' in the product name. So the Bedale, Beaufort and Border are traditional waxed cotton and the Classic Bedale, Classic Beaufort and Classic Northumbria are made from Sylkoil (think of the Classic Northumbria as a 'Classic Border'). So which is better, i hear you ask? I'm afraid we can't give a definitive answer. In terms of waterproofness, thornproofness and durability they are effectively the same. It basically comes down to which style you prefer the look of - and only you can decide that. The 3 main styles also differ in the arrangement of their pockets and some other design qualities, and for some people this can be an important factor in deciding which style to choose. The following pictures illustrate some of the features and the table below shows which jackets have which features. The bellows pocket on a Barbour Beaufort. The fabric is waxed cotton. 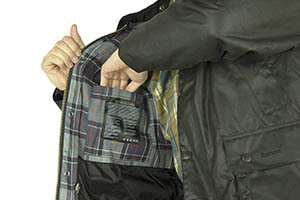 The handwarmer pockets on a Beaufort jacket. 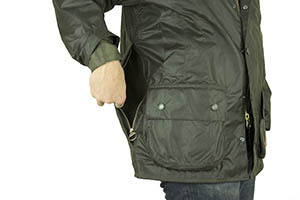 The inner pocket on a Barbour Beaufort. The Border also has this pocket. 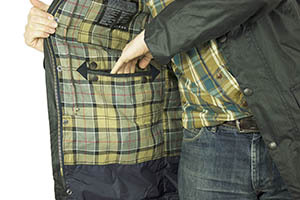 The same pocket on a Barbour Bedale. The fabric is sylkoil. 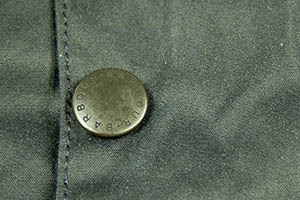 A closeup of the moleskin lined handwarmer pockets The inside breast pocket on a Bedale jacket. This is velcro fastened. 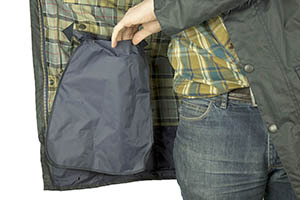 A large pocket on the rear of the Beaufort, accessed by external zips. Originally designed to carry game and the nylon lining is easy to clean. Two removable nylon pouch pockets on the inside of the Border / Northumbria. Large capacity and ideal for wet / dirty items as the pockets can be completely removed and swilled under the tap. To tighten cuff ends and prevent wind and rain going up the sleeve. 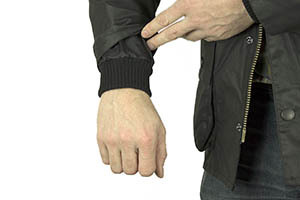 Note the outer sleeve has been pulled back a little to show the cuff - it is not usually this visible when wearing the jacket. To choose the correct size jacket, you need to know your chest measurement. You should do this just over the skin or a thin shirt. Take the measurement around the fullest part of the chest, ideally using a flexible fabric tape. Whatever measurement you get (in inches) is the size you should order. If you measure 42 inches select the size 42" from the dropdown size choice. If you measure between two choices e.g. 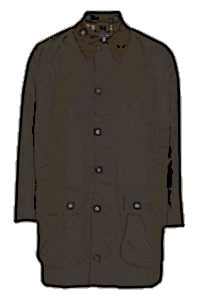 41" then we usually suggest rounding up although you would also be OK to round down if you prefered the jacket to be a closer fit. You do NOT need to add any extra to allow for undergarments or room for movement as this is already taken into account. Each jacket has what is referred to as 'chest tolerance' or 'ease allowance' which is the extra amount left for movement and other clothing layers and all the jackets we're discussing here have 9 or 10" of chest tolerance. This means that a 40" jacket will actually measure 49" or 50" all the way round the chest area. This is fairly generous, but not overly so - it is typical for outer overcoats to have a tolerance of of at least 8". If you want to see the exact sizes we got when measuring actual garments see the table below. A = under the armpits from the side seam to give the chest measurement. 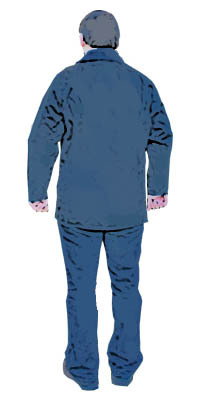 B = under the armpit from the side seam to the hem of the sleeve to give the sleeve length. 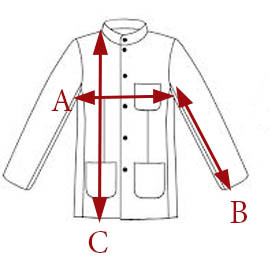 C = the seam under the collar to the base of the garment hem to give the full length measurement. N.B. These measurements were obtained by measuring actual stock of the garments and is intended as a guide and is NOT an exact technical specification. Unsure which liner to buy for your Barbour Jacket? Below is a guide for the core men's styles. 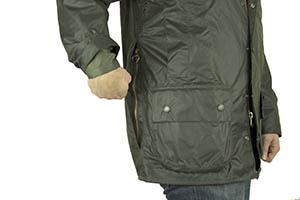 Some of the jackets above have a number of suitable accessories such as hoods, and liners that zip in for extra warmth. 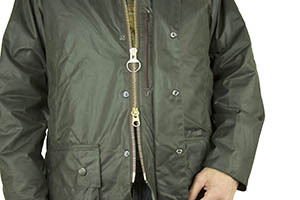 The zip in warm pile lining (Old code A306 / New Code MLI0004BR31) will fit any of the jackets (not including the Bushman / Stockman). The quilted waistcoat / zip in liner is a little more complicated. Technically, any colour will fit any jacket provided they are the same size but you really should make sure you choose the correct colour or the lining of the jacket will not match the lining of the waistcoat. Illustrated below are the Tartans and the table below that shows the correct choices of liner. 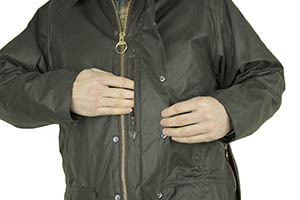 Make sure you choose the same size - if your jacket is 42" choose a liner in 42". The jacket will usually have the size on the label if you are unsure eg. in this case it would say C42. 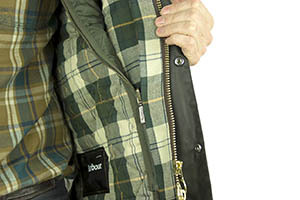 If you have an older style of jacket with press studs on the inside instead of the zip for the liner, the bad news is that Barbour no longer manufacturer the liner to fit these discontinued jackets. 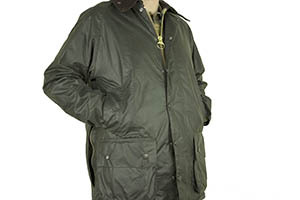 As authorised Barbour retailers, all the wax jackets we supply come complete with a 1 year Barbour guarantee of workmanship and materials. You should complete the registration document that comes with the jacket and return it to Barbour, and retain the other part for your records. 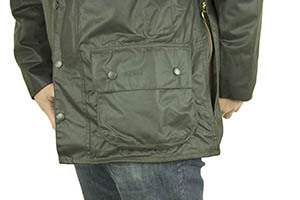 It is highly unlikely you will need this though as Barbour jackets are contructed to the highest standards and must pass rigourous quality control checks before being sold. 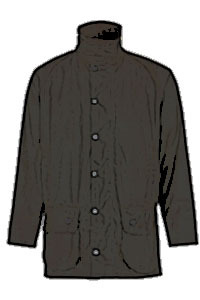 A wax cotton jacket will last for many years, but does need some periodic care in order to retain its' waterproof qualities. 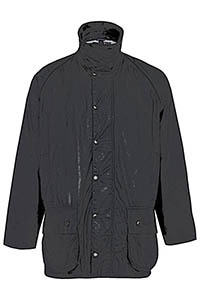 If you prefer, you can return it to Barbour's excellent customer service department who will rewax it for you and make any minor repairs necessary. They can also make alterations. It is fairly straightforward to maintain the jacket yourself, and every Barbour wax jacket contains instructions on how to carry this out. 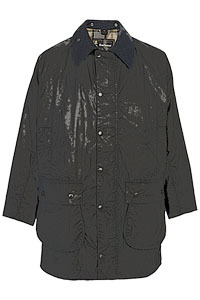 The most important thing is that wax jackets are not machine washable. 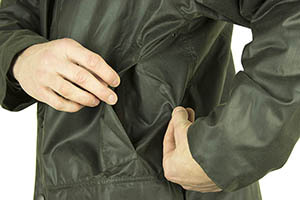 NEVER, EVER use hot water or chemical detergents to clean your jacket. You will remove the proofing wax and oils and the jacket will be irreversibly damaged. Only ever clean your jacket by brushing off large pieces of dirt and grit and then cleaning with a sponge using COLD water only. Once the jacket is clean, you do need to reproof the garment periodically. How often will depend on the amount and type of usage it receives. You should pay attention to any 'dry' areas that may appear. These tend to be in the natural creases of the garment and also where the garment naturally rubs together, such as the sleeves against the sides of the body. These dry areas can be treated as they appear but the whole garment should also treated periodically as follows. You need a tin of Barbour Thornproof Dressing, a pan of hot water, and a soft cloth or sponge. Stand the wax in the hot water to soften it, as it is a solid at room temperature. Using your sponge or cloth, work the wax well into the fabric. It is important to really work it in, and not to simply 'paint' it on. Pay particular attention the the high wear areas as mentioned above (i.e. creases and rubbing areas). Try to remove any excess once the wax has been worked in. When you have finished applying the wax, for the best finish you should then hang the jacket up on a coathanger and give a blow over with a hairdryer to slightly remelt the wax and give a smooth, even finish. 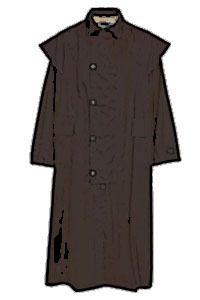 Then leave the coat on the hanger in a warm place such as a boiler cupboard or an airing cupboard.